How Can I Make Money in the First Year of MIPS? In the CMS MIPS (Merit-based Incentive Payment System) program, the clinicians who do not report will feed the incentive money for those who do report. It’s called a budget neutral program and in this week’s blog we visually explore this concept with a graph that will help you understand how the program is slated to work. We also review the different reporting options for clinicians and reveal the magic number that will award you extra funds for the Exceptional Performance bonus. In the graph below, the first thing you’ll notice is the big red box that says “not reporting.” By not reporting, you will automatically have -4% reduced from your 2019 Medicare fee schedule. By reporting anything at all you will get a MIPS score of at least three points. See how the money indicated in red changes to green as it is distributed to everyone who did participate in the MIPS program? Anyone whose MIPS score is between three and 100 points will receive up to a 4% increase to their 2019 Medicare fee schedule. There are two number scores you want to note. The first is three points. As mentioned above, this is the number that you must achieve to avoid a penalty. Now by reporting something, you aren’t guaranteed to get an increase to your Medicare fee schedule, but you are guaranteed to NOT get a decrease in funds. You may break even and receive a 0% increase to your fee schedule. It’s not clear how CMS will distribute those funds, but we know they will be distributed among those who participate. The second number to note is the magic number we mentioned at the beginning of this post. That number is 70. If you achieve 70 points or above for your total MIPS score, you’ll be eligible for the Exceptional Performance bonus money. CMS has set aside an additional $500 million to fund this bonus money. You’ll see in the image below that for anyone scoring between 70 and 100 points they will receive anywhere from 0.5% – 10% as an additional increase from that $500 million. Keep in mind that this is money given to you on top of the money being distributed to all particpants. Phew! The reimbursement funds in 2019 will be a feast for some and a famine for others. It’s time to get yourself a little slice of that pie. Below are the reporting options for you in 2017. As a reminder, here are the categories of MIPS broken down by category weight. 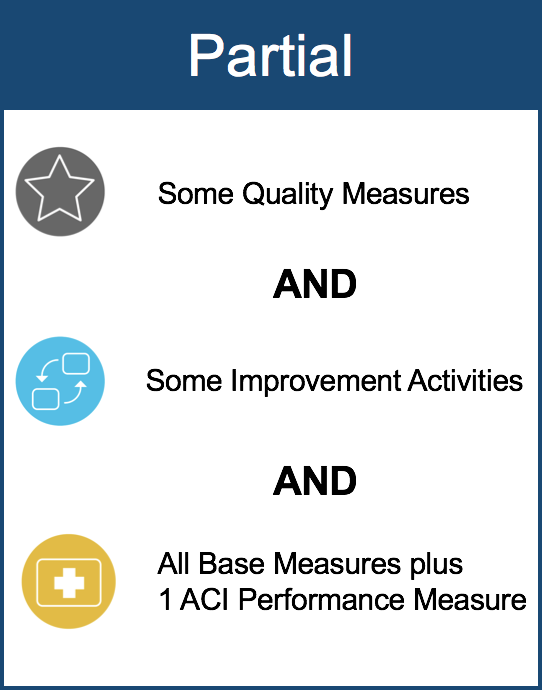 How you perform in each of these categories will award you a total MIPS score. Quality is worth 60 points. 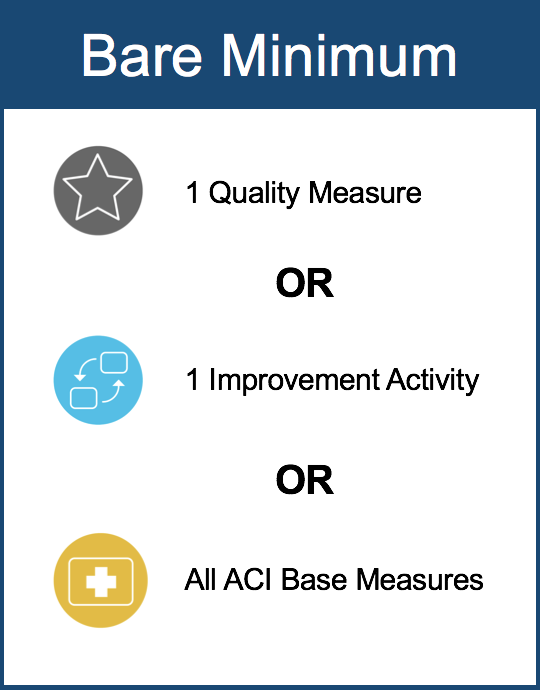 The Improvement Activities category is worth 15 points and the Advancing Care Information category is worth 25 points. These together total 100 points which is the basis for the point line we studied above. Before we go any further with category requirements, I will link below to our three-part series that thoroughly examines the requirements for each category of MIPS. If you get lost, reference these blogs to help you sort out the requirements. If you do just these requirements below you will get a total MIPS score of at least three points. This will ensure you don’t lose money in 2019. 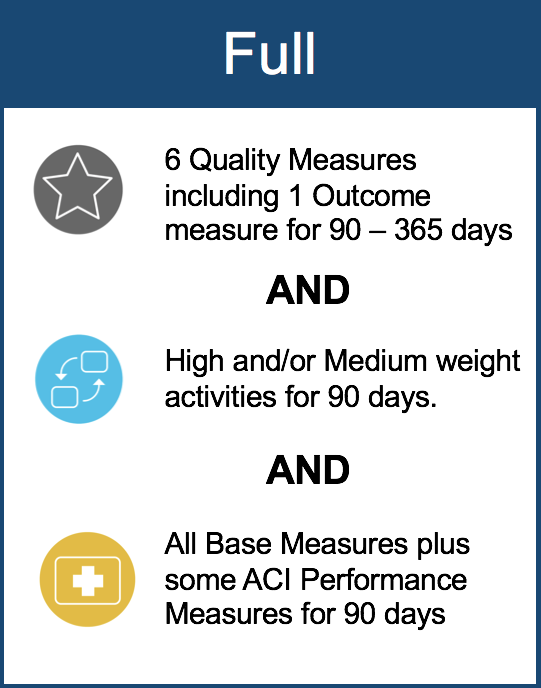 You could submit one Quality measure with data from one day of 2017 and get three points. But come on. You can do more than just that. We believe in you. Here is a look at the requirements for partial participation in the MIPS program. Note that the guidelines aren’t very clear, but the biggest differentiator between the two reporting options is that with partial participation, you must submit something from each category. For partial participation, some data from all three categories must be submitted for at least 90 consecutive days of 2017. Now for those of you out there that are looking to make a bit of money in 2019, you will want to fully participate in MIPS. It’s not as hard as you might think. For instance, you do not need to report for 365 days of the year. In the Quality category, you are required to submit a minimum of 90 days up to 365 days. The other categories only require 90 consecutive days of data. Here are the requirements for full participation in MIPS. In the end it’s really up to you. Do you want to have a feast in 2019 or do you want to be stuck in a famine? Want to get started, but not sure what to do? Reach out to us today to get started.